Eleven years ago today I heard the news on the BBC and then went straight to the television. I saw a tower of the World Trade Center smoking and on fire, and I hoped with some horror that air traffic controllers had made a terrible mistake, and I listened as the newscasters wondered. And then I watched as the second plane hit, and I knew it wasn’t an accident. Eleven years ago today I was dressing my baby girl in the sunlight on her changing table, and my husband came in to tell me that the Pentagon had been hit, too, and I was terrified of what we were in for. Eleven years ago today I watched too much television, until a wise neighbor explained that children don’t realize that they are seeing a recording; instead, they believe that it’s happening again and again. I turned off the TV. Seventy-four years ago today, my father was born. He came home on time from work every night and played horse with us in the living room, and read us all the Little House on the Prairie books, and all the ones about Narnia. Once a month, he came into our bedrooms at night with a tape recorder and asked us questions about ourselves, and saved the recordings for posterity. He built us snow forts in the winter; he played frisbee with us in the spring. He took pictures at all my orchestra concerts and all my school plays, and took me out for an ice-cream soda when I was inducted into the National Honor Society. He read the newspaper. He went to church. He sang in the choir and made subtle but clearly silly gestures from the choir loft to his daughters in the pews. He worked at a job he didn’t love with a far-too-long commute so that we wouldn’t have to change schools. He sent me to college. He wasn’t a perfect parent, but he said he was sorry every time he was wrong, and he meant it. 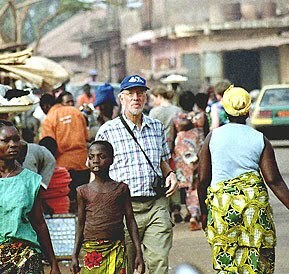 When he retired, he and my mother joined Mercy Ships. As part of their discipleship training, they traveled to Uzbekistan. This morning on the phone, he remembered to me the women at their yogurt stalls there, each of them offering free samples. He loved the Uzbekistani yogurt. He loved many things about Uzbekistan. While they were there, he and my mother carried a document written in the native tongue. It was an apology, asking forgiveness and expressing genuine sorrow for the devastation wreaked by Christians during the Crusades hundreds of years ago. They shared the document with anyone who would read it, and many, many people read it, and seemed glad. Maybe the Crusades seem like old news to us. Maybe we think they and all those affected by it are long gone. Maybe we think everyone should be over it by now. And 9/11 wasn’t about the Crusades, anyway, right? But my parents learned that, in their way, the Uzbekistanis remembered the Crusades very well. I think all of us, left to our own devices, have long memories for pain. Pain is a loud thing, and violent, in its way. Forgiveness is a quiet thing; grace is too subtle sometimes to capture on camera, and they are often slow to the uptake. Sometimes it seems like a terrible thing to say you’re sorry. Sometimes being gracious is the last thing I want to do, but I’ve seen it make an enormous difference. It helps in life to have people who have gone there before us, who have known mercy and so therefore show it, who are willing to see that they are wrong sometimes, and then be the ones to apologize. To live out grace. Not the kind of thing that works very well in a sound bite. But I do have this small platform, this little blog where I can celebrate those enormous quiet things that make all the difference.